(without stand or speakers) 22.6" x 14.5" x 1.7"
With energy-efficient technology and a sleek minimalist design, Coby's ultra-slim LED TVs will dress up your living room while dressing down your carbon footprint. The LEDTV246 has a vibrant 24" widescreen for a premium viewing experience, with digital HDMI connection for crystal-clear high-def picture. 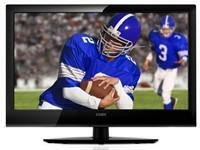 Multiple inputs and a 15-pin VGA interface allow the LEDTV2426 to be used as a television or computer monitor. Digital noise reduction, film-mode detection, and integrated parental control also included.